Congratulations to Sandy. I've contacted Sandy via Ravelry to gather her mailing address and her Quince & Co. Owl color choices. All is set to go. Thank you to Kirsten Kapur, Mary Lou Egan and Gale Zucker for the book to give away and to Quince for playing along as well. I'll have another giveaway very soon! Now for a few odds and ends. I am so excited about the fall issue of Vogue Knitting Magazine. You have to get your hands on this issue. 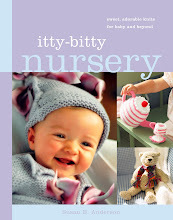 I love and want to knit almost every project in the magazine, plus there are great articles with loads of information, tips, and beautiful photos. It is an issue mainly devoted to Fair Isle knitting and what design could be better to grace the cover than from the talented colorwork genius Mary Jane Mucklestone. Mary Jane is so deserving and I just honestly feel thrilled for her. I hope you all get to take a class someday from Mary Jane and meet her in person. She is interesting, smart, and fun and full of life. She has an article in the magazine about Fair Isle Knitting tips. And that hat on the cover is flying onto my needles. I am in love with this sweet little pointy hat. I have an old stash of Rowan Felted Tweed DK as you can see in the photo above. 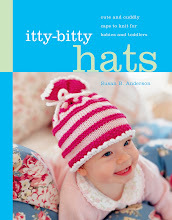 The hat on the cover is made in the same yarn. Now I just need to figure out my colors. 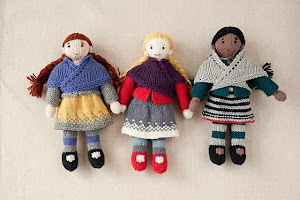 Click here to see Mary Jane Mucklestone's designs on Ravelry! 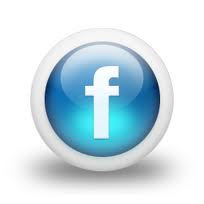 Click here for Mary Jane Mucklestone's website! Her world travels are amazing to follow. Click here to follow Mary Jane on Instagram! You'll want to follow her. 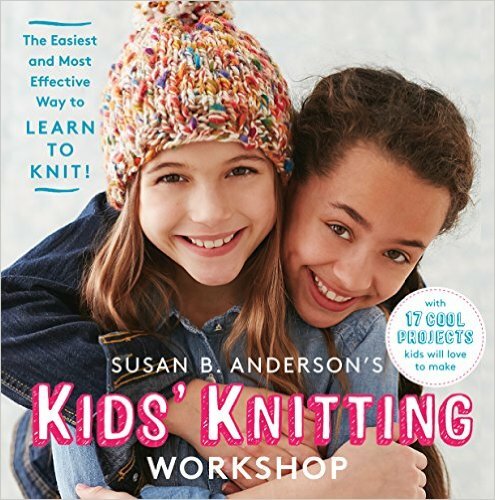 Click here for Vogue Knitting Magazine! Really, go get this issue! Click here to see all of the designs in the Fall 2016 issue of Vogue Knitting Magazine! The magazine is in a new format and size. It is just stunning and exciting. 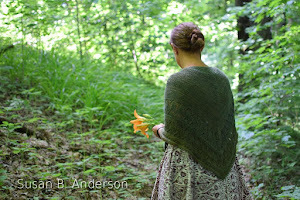 There are lots of other designs by fantastic knitters that aren't colorwork, as well. The runaway hit seems to be the sweater from another favorite designer of mine, Nora Gaughan. There is something for everyone. I'll keep you posted on my hat progress. I'm casting on today. 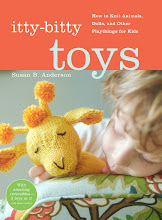 I have revamped my Build a Toy Workshop handouts for my upcoming classes this weekend at Knit City in Vancouver and for other upcoming venues. I am super excited about it. This is one of my favorite classes to teach because it lets the students take over as the designer with lots of guidance. I can't believe some of the fun knit toys that have come out this workshop. The photo shows just a few of the options you can make with the patterns provided in class. 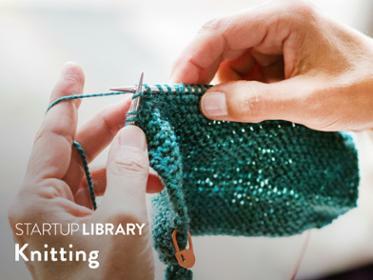 Click here for Knit City in Vancouver! Oct. 1-2, 2016. There are still a few spaces left in two of my classes. I hope to see you there. I have a book signing on Sunday morning in the market at 9:00am, too. 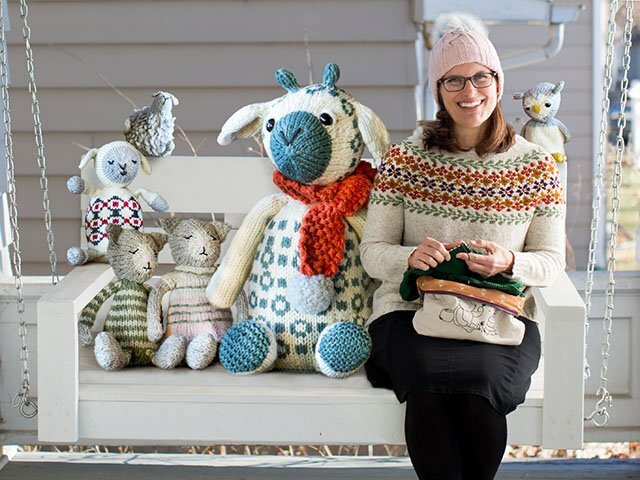 Click here for Vogue Knitting Live in Minneapolis! November 4-6, 2016, registration is open. I've finished the purple-themed socks I had been working on for awhile. They were a gift for my sister-in-law. The Opal yarn is discontinued but you can still find it on Etsy.com if you look it up. Opal Sweet & Spicy 2, color number 8615. Cuffs, heels, and toes in Opal Solid in color 5186. Here is the finished pair. My sister-in-law received them in the mail the other day and she said she cried when she opened the package. She tried them right on and said that the fit is perfect! Now that makes you feel pretty good and appreciated I'd say. She is a teacher and she told me she couldn't wait to show everyone at her school. That's about the cutest thing I've ever heard. I used my new sock pattern called Smooth Operator Socks. 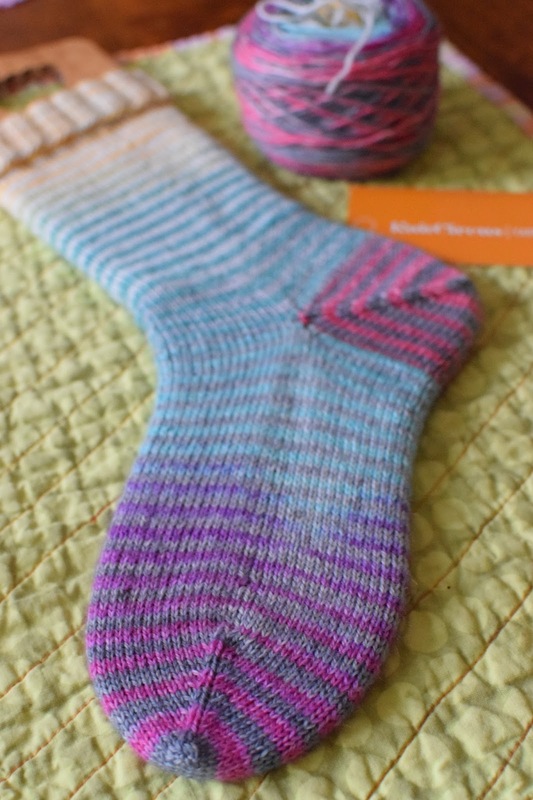 Click here for the Smooth Operator Socks pattern information or to purchase! 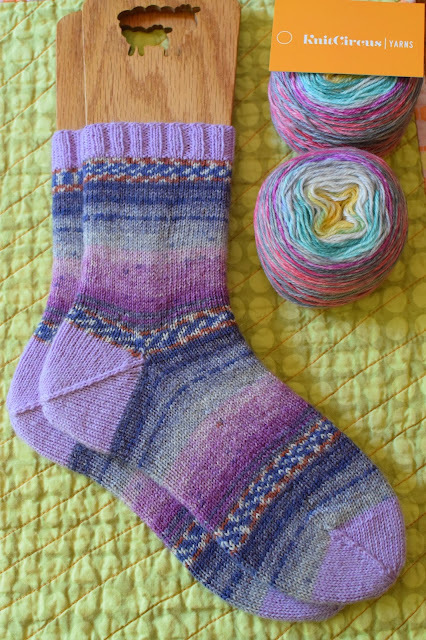 For this pair I used the No-Kitchener stitch toe and heel option, and the single line decrease option. Both of these options are included in the addendum to the pattern. Then I cast on a brand new pair. I am using the Twister Stripes colorway from Knit Circus Yarns. I got the 100 gram set, the yarn comes in two matching cakes. I made the cuff 9-inches long in total and I made a 3-inch ribbed cuff to turn down. 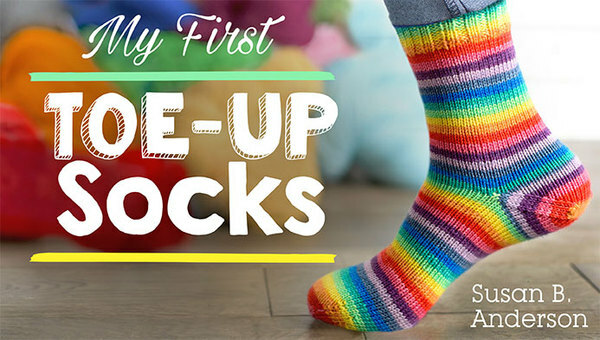 Next time I will try their smaller size socks sets. 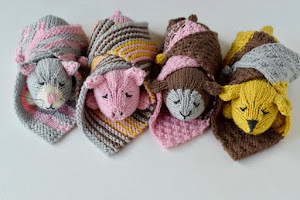 They have a medium-size that would be the perfect amount of yarn. 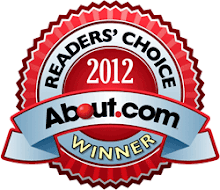 Click here for Knit Circus Yarns! 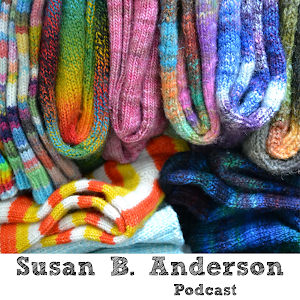 The sock pattern is again my Smooth Operator Socks pattern. For the heel I pulled the yarn from the other end of the yarn cake, I pulled from the outside. 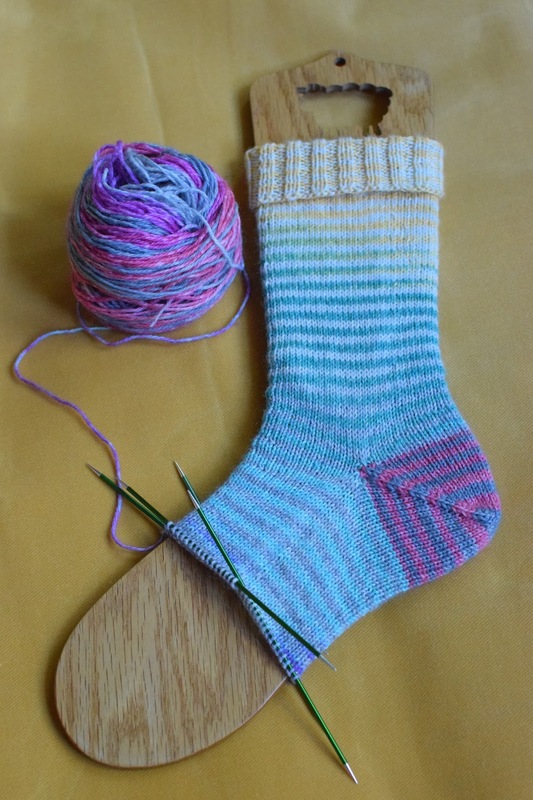 This works out so well because then you are using the last color of the gradient stripes for the heel. The challenge is to get to use all of the yarn and colors when you are working from an incredibly fun gradient yarn like Knit Circus. This makes it certain that you will reach the end color. For this sock I used the Smooth Operator Socks original heel and toe decrease, with the rounder Kitchener Stitch toe and heel. The rounded toe and heel Kitchener Stitch option is found in the pattern addendum. I bet you all have a lot of autumnal knitting odds and ends going on, too. It's that time of year and I am really happy about that. I am getting back into teaching again which feels good. 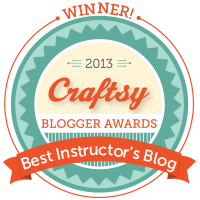 I hadn't taught since last May before the Knit Circus Retreat. 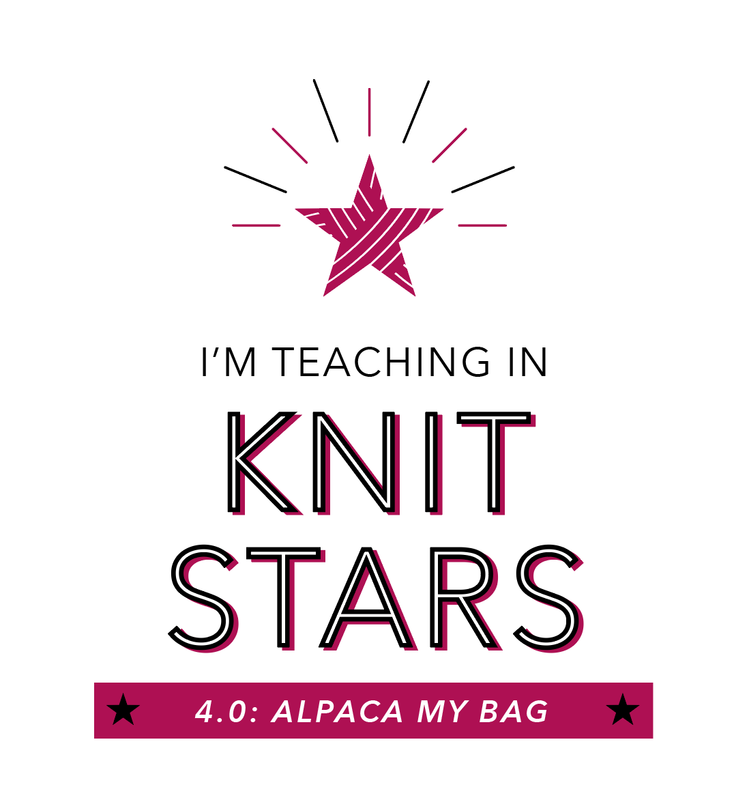 I really love to teach knitting workshops and it's good to have lots of venues on my schedule for the fall, winter and spring seasons ahead. I'll be back soon. I'll try to remember to take lots of photos while I'm in Vancouver. I'll have lots to share next week. I'm already planning.